As I often say with fondness, there’s no pro like an old pro. By “old,” I am not referring to age as much as to experience and seasoning that gives a performer reliable techniques to entertain while also displaying his or her artistry. “Pro” is operative word in the sentence. It connotes the tested assurance and skill one brings to every part because he or she understands the subtleties of characterization, text, and attracting an audience. “Love Letters,” at Wilmington’s Delaware Theatre Company, stars two fine-tuned pros, Michael Learned and Daniel Davis, who wring every ounce of comedy, emotion, and sentiment from A.R. Gurney’s humorous, touching, and durable script. By now “Love Letters” is an old pro itself. The play, composed of letters read from the text by actors who do not leave their alleged writing desks, is deceptively complex. It does nothing less than take you through two interesting people’s lifetimes via letters that passed between the two from their childhood until one of them dies. Gurney, whose wit and sensibility have been established through a prolific body of work, creates active, dimensional character who express themselves through writing. Melissa Gardner and Andrew Makepeace Ladd III fit the Gurney mold. They are well-heeled WASPs from families that are serious about breeding and that train them in etiquette and social graces from birth. Melissa is a bit of a maverick who laughs at her upper class surroundings and, in her youth, thwarts efforts to tame or domesticate her. Andrew is more traditional, making his way through a posh boarding school to Yale, then on the Navy before going to law school and landing in Congress. To Gurney’s credit, and Daniel Davis’s, Andy is never stodgy and can understand, if not share, Melissa’s more jaundiced, carefree, and droll view of the world. Davis and Michael Learned quickly form personalities for their characters. You know from Learned’s delivery of Melissa’s grade school missives that Melissa has a cynical and critical streak that cause her to react to most things with a response that amounts to “oh, brother!” Melissa is a bit of a rebel and given to emphatic, but clever, use of the slang of her day and to exclamatory appeals for help. Learned captures her clear-eyed, ironic tone along with conveying Melissa’s amused, sardonic take on most of what happens around her. Davis is more sincere as Andy, who realizes as his age hits double digits, that he enjoys writing, from the basic act of holding a pen, a Parker 51, in his hand to composing thoughts meant for one other person to read. Davis begins by bringing his deep, resonant voice to a child’s register. Not like a cartoon character, but by using a lighter, higher timbre. As Andrew progresses in age, Davis’s voices changes, so you hear the first confidence of young adulthood and the trained, musical notes of a man who makes his career as a member of the U.S. Senate. Davis unfailingly finds the humanity in Andy. Although he is more conventional than Melissa and leads a more stable, routine life with career, wife, and children, Davis gives Andy energy and an aura of one who has unending interest in the world. You hear joy and contentment even when Andy is busy with political matters. You also hear Andy’s wit and know that he takes a broad view of life. He just chooses to live his more responsibly and traditionally than Melissa does. Because of the traits Learned and Davis give Melissa and Andy, you like both characters and are genuinely interested in their friendship and continuing relationship. Both actors find a gamut of nuance that takes his or her character from the page and animates them. You can envision the scene being related by Andrew’s Parker 51 or Melissa’s pen, typewriter, or whatever she has handy. Andy gets enjoyment from handwriting and sending personal notes in his own elegant script, a love Davis conveys with great affection. “Love Letters” has been a staple of the theater since it made its first appearance in 1988. The show’s technical simplicity is attractive, but so is the chance is provides for two actors to give vibrancy to the written word. While Learned and David are doing “Love Letters” in Wilmington, a revival has opened on Broadway where the pair of readers will change regularly, the first two being Mia Farrow and Brian Dennehy. Michael Learned is a veteran of “Love Letters,” having toured in the show with Gavin MacLeod in the ’90s. She catches all of drama and emotion inherent in Melissa’s letters and never makes it seem as if Gurney’s material is old to her. You’d never know that from Davis’s readings. He lets you know who Andrew is from the beginning and finds several passages throughout the script in which he can life Andrew off the pages and make him immediate. In one sequence, Davis and Learned have to speak fast and almost talk on top of each other, or interrupt the other, and the exchange is beautifully timed and wonderfully played. 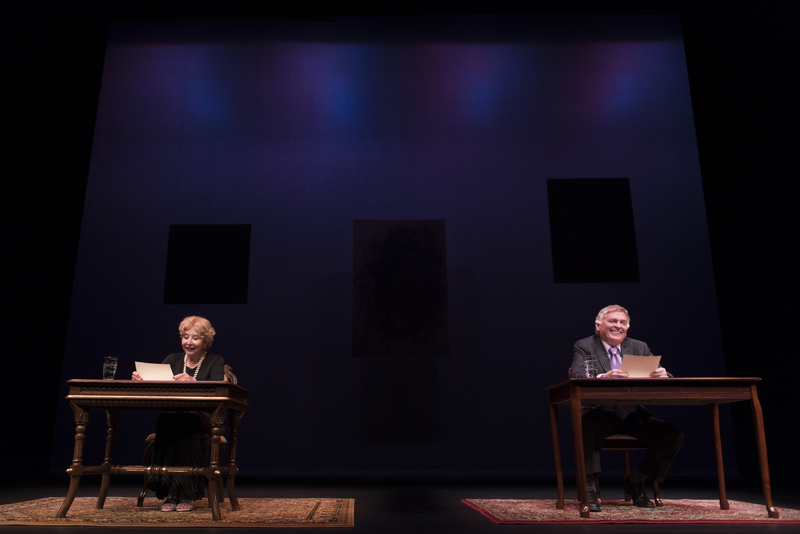 “Love Letters” is always rewarding, but Michael Learned and Daniel Davis give it the personality and texture that maximizes its warmth and its wit. Melissa is an artist, and throughout DTC’s “Love Letters,” you see paintings by Mary Page Evans, lit evocatively by an equally artistic Scott Cocchiaro. “Love Letters” runs through Sunday, October 5 at the Delaware Theatre Company, 200 Water Street, in Wilmington, Delaware. Showtimes are 7 p.m. Thursday, 8 p.m. Friday and Saturday, and 2 p.m. Wednesday, Saturday, and Sunday. Tickets range from $45 to $30 and can be obtained by calling 302-594-1100 or by visiting www.delawaretheatre.org. This entry was posted on September 25, 2014 by nzoren in Theater Reviews and tagged A.R. 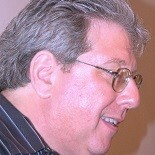 Gurney, Bud Martin, Daniel Davis, Delaware Theatre Comoany, Love Letters, Michael Learned, Play, Theater, Wilmington.